Announcement Handmade Waldorf-inspired designs for storytelling, nature tables and seasonal displays. 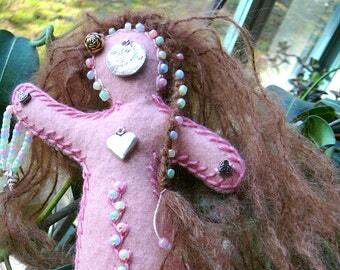 Art Doll Miniatures, Wall Art and Wearable Art made with natural materials, love and attention to detail. Handmade Waldorf-inspired designs for storytelling, nature tables and seasonal displays. Art Doll Miniatures, Wall Art and Wearable Art made with natural materials, love and attention to detail. For a custom order it was a quick turn around. Absolutely love the item. Working on an aqua angel. Ready to ship-these holiday items. Ready to ship, not too late for Halloween. For many years I was a teacher and was fulfilled. I have retired from teaching and I am so happy to be spending my days in arts and crafting. I have been a crafter since childhood-my grandmother taught me to knit, my mother, to sew. I describe myself as a needle and mixed media artist as that encompasses a broad range of my projects: Peg dolls, knitted goddesses, prayer flags, garden art shingles, photography and so on. I started my shop to offer many of the items I made for my classroom but also to express my interest in spirituality, myths, folktales and fairy-tales. I think having a creative outlet is essential to a happy, fully developed human being. I have retired from teaching; I am so happy to be spending my days in arts and crafting. 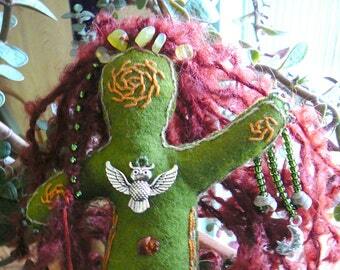 I describe myself as a needle/mixed media artist as that encompasses a broad range of my projects: Peg dolls, knitted goddesses, prayer flags, garden art, etc. Should an item not meet your expectations I will gladly exchange it or refund your money. You are required to pay for return shipping and I must receive the item in original condition. Packages do get lost or damaged in the mail and that is beyond my control. If an item is lost or damaged in shipping that is the responsibility of the USPS and a claim can be filed to recover the loss. Contact me and we will work together on this. Sorry, no returns on custom items. Returns will not be accepted on international orders due to customs fees. I accept PayPal and major credit cards and payment is expected prior to shipping. I prefer that you use PayPal because the funds are immediately available to me whereas with credit cards I wait 3-4 business days for the funds to arrive in my bank account. This slows down the shipping of your order. Payment must be made at the time of your purchase. To keep shipping costs down I will mail your order via USPS First Class mail as soon as possible depending on the the number of orders on my workbench and upon receipt of verified payment, excluding Sundays and holidays. To reduce waste and shipping costs, multiple items will be packaged together. If you'd like separate boxes or have other special shipping requests, please let me know. I ship to your address in your Etsy and Paypal accounts. If they don't match, please let me know which one to use! I welcome custom orders, just convo me!